Mommy misses you a lot. Whenever Mommy sit down and think of you, tears started to drop. At night, Mommy will still browse the photos of you in Mommy’s phone so that I will not forget your beautiful look. You look so different in person and in photo. Mommy is afraid that Mommy will forget your actual look. Mommy missed carrying you, kissing your forehead, caressing your fine hair, touching your lips, gazing your lovely eyes, our breastfeeding time, making milk for you, administering your medication, the sound of the feeding pump, your cry due to discomfort and cry in request for us to carry you. Mommy still don’t understand why God gave me a sweetheart like you but make you suffer and then take you away from us. It is because of our sin? Mommy have been praying to God for His healing power. It will be a miracle if you are healed. But God just didn’t want to perform that in your life. There is a reason. Despite all these, we will still obey and love God. You are now in God’s good hand. He has ended your suffering, pain and discomfort. He knew the best for all of us. Although it’s tiring and requires lots of sacrifice, Mommy has not been complaining in taking care of a special baby like you, hoping that you will one day get well and overcome all the discomfort. Because of the faith we have in God, it has never come to my mind that God will take you away so soon. We know the day will come but why so soon and without any notice? Mommy should have listened to Daddy to stay at home to take care of you. Mommy didn’t try to ask for unpaid leave because of the worries in the office as no one is able to backup for me. Knowing my bosses, they would not approve and that will leave me to tender resignation. But that is not a good move as financially we are not ready. We need to save money for your medical use since you are not covered by any insurance. It’s all too late to regret now. Mommy bought so many nice clothes for you in preparation for Christmas and CNY. That shows how long Mommy would want you to be with us. Few days before your last admission, Mommy was just talking to Daddy on the deco theme for Christmas. Mommy was also thinking of bringing you to church for that very first time on Christmas day. Christmas is not the same without you. No deco and Christmas tree put up at home last Christmas. Yesterday night, it struck my mind that God took you away before Mommy could dedicate you in baptism. It is like a mission uncomplished. I hope God will consider you being saved. Whenever there is gathering with friends having babies about your age, Mommy tried to avoid it. Mommy couldn’t bear to see other babies gigling and tosing around. It makes me jealous and heartbroken. When I see those pretty dresses hanging for sale at the shopping mall, my heart ache. I could imagine how beautiful you will be in those dresses. Everything of you has turn to memories and imagination. Thank you Samantha for your presence in our lives. hoping in our hearts you’ll be comfortable all the time. He still thinks that you are in the hospital. He’ll understand one day that you’re with Jesus now. Aunties and uncles will always remember you in their heart. It will be heartaching for Mommy and Daddy when putting away your things and toys. Daddy and Mommy will continue to draw strength from the Lord. Do bless them so that they could care for other Mitochondrial babies too. Enjoy your time with Jesus while waiting for Daddy and Mommy. Do show to Daddy, Mommy and Jonathan kor-kor when we see you then. Rest well our darling baby, you will be dearly missed. Though you are far away from us, you are always close to our heart. Indeed God loves her more than we do. Thank you all for your prayers. She is now in God’s good hand. No more pain, no more sickness and no more fear but joy and peace of our Lord, Jesus Christ. Sam returns to God at 1:23PM 19 Nov 2010. 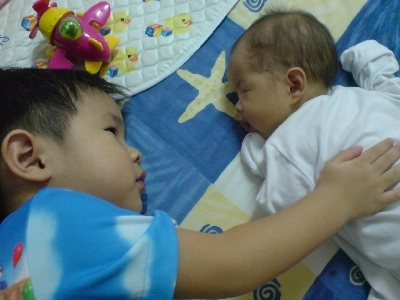 Her body was laid to rest in Sitiawan, her Daddy and Mommy’s hometown, on 20 Nov 2010. Samantha…Daddy, Mommy & Jonathan kor-kor loves you. You will be missed dearly… See you again in Heaven. Let this be the first good post of Samantha. She is now 5 months old based on her age. Physically she is like a 2 months old baby except that she is still quite floppy and unable to support her head yet. Still wearing newborn sized diaper and clothing. 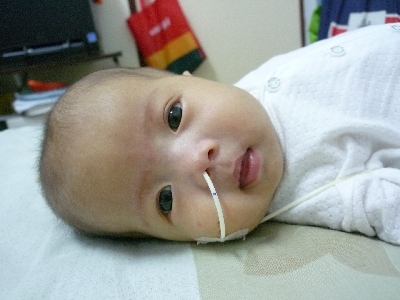 It has been a month since Samantha was discharged from GHKL. She is tolerating milk via the feeding tube as mentioned in my earlier post. I resumed breastfeeding so that my breast won’t be an alien to her and also to keep my BM supply going which has been decreasing. We also offer her water through bottle to stimulate her sucking reflex and in case she is able to go back to bottle feed again. Her doctor disallow us to BF and bottle feed her as afraid that she may get choke but so far she has been taking it well. (Shhh…can’t let the doc know). She gained some weight from 3.3kg to 3.65kg within a month. Not much but this is consider a good progress despite her condition. It will be a long way for her to catch up with babies of her age. She looks chubbier now. She can sleep better and for longer hours too nowadays. On and off, she still whine and cry unconsolably which could be due to colic, reflux or soiled diaper. Talking about soiled diaper, Samantha is really a princess! She wants to be changed IMMEDIATELY once her diaper has soiled else she will not stop crying. Sometimes, she just want you to check on her diaper eventhough the diaper is not soiled. Her big brother Jonathan adores her so much. He likes to kiss her, smell her, carry her, hold her hand and sleep beside her. He will take her hand to caress his face. And recently, I have no idea why he feels like biting her fist…love bite? Samantha is back home from hospital last Thursday after her readmission for 16 days. We hope the hospital won’t be our second home. It’s quite scary in the hospital as you would see all kinds of patients with some having metabolic disorder like Samantha. The first thing that came to mind is will Samantha be like them? If you know the prognosis of her medical condition, you’ll have the same fear as we do. In summary, Samantha is suffering from a disorder called Mitochondrial Disease which also caused her lactate acid and PH to be very high. You can read more here as it’s too scientific for me to explained. This disorder has affected her kidney, liver and brain at this juncture. Initial abdominal ultrasound could not locate her left kidney and so they suspected that she has only one kidney but latter ultrasound managed to located her left kidney but it is very small. Since her renal profile are quite normal, they will perform a functional test later on her. Her liver is enlarged. Current size is about 5cm compare to normal size which is about 2cm. The doctor are still monitoring her liver for any liver impairment for liver failure. We had the MRI brain scan done for Samantha and the result shows that the part of her brain that controls her motor skills are badly affected. Her eye may be affected as well as the brain controls the eye vision, movement and coordination. Samantha has to go home with a nasogastric (Ryles) feeding tube. Not what we expected but at this moment, we can see this is the best for her. Most importantly, it can help to reduce her vomiting as tube feeding is a gentle way of feeding. She doesn’t have to use much energy as compare to sucking from the bottle because the milk and medicine/vitamin enters her stomach directly. Tube feeding is common for children with failure to thrive. Administering medication to her is much easier now as she doesn’t have to get agitated with the horrible taste. Feeding through the Ryles tube requires a feeding infusion pump that controls the delivery rate of the milk (75ml in 3 hours). This will restrict her mobility as she has to be hooked to the feeding pump for at least 3 hours. Another way is to use a Bolus (a type of syringe) but the flow of the milk is faster. When we looked at other parents with their normal child, we are challenged mentally and emotionally. However, after all these, we are still glad and thankful. We are unable to forsee the future and what is the life span for Samantha. What we could do now is to look upon God for His healing powers. Take things one step at a time and appreciate the moments that we can have with Samantha without neglecting Jonathan.